As with my other filmumentaries this is a completely unofficial and non profit making project made with a genuine affection for the film. Please share the link with your friends but under no circumstances should you buy or sell this on DVD or Blu Ray. This was really a spectacular edit, and Jamie Benning (aka Jambe Davdar) has really honed his skills crafting what he calls "filmumentaries." I loved his Star Wars docs, and he has improved his craft sine then. 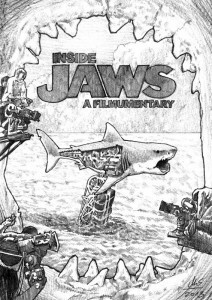 "Inside Jaws" offers a TON of information as to the making of the film. Jamie has unearthed new material, going as far as conducting new interviews with cast and crew. Anyone who is a fan of this movie or wants an inside look at the filmmaking process should really watch this. On a technical level, it is very well done. Some of the source material is obviously of lower quality, but Jamie has done a pretty good job of improving it as best as possible and making it flow seamlessly together. I can't wait for the next filmumentary!